Are you one of those who wants to know why..
Great, continue reading because we’ve got some nice solutions. We all know the fact the technology has brought great reliability among the people. No doubt it has greatly helped the people by all means. But after all it is technology! Like humanity, it also has some problems.There are different types of technologies. Most commonly used is the laptop. The laptop is generally the most usable technology among the people now-a-day. Every work is happening with the help of laptops. But as mentioned it also have some problems, like shutting down, overheating, etc. Let us discuss the most common reasons laptops shuts down randomly and how to fix it? Yes, it is true that the excessive use of laptops leads to a random shut down. Most of the people do not understand the reason behind this problem. This generally leads to dissatisfaction of the customers towards the desired brand companies like Dell, HP, Lenovo, Sony, etc. No matter what, your laptop shuts down after an excessive use. The most commonly caused problems include, overheating, battery, hardware failure, ram cashing, faulty power supply, no laptop service, window issue etc. These following information can greatly help you in understanding the issues and reasons why your laptop shuts down suddenly and how to fix them! Studies shows that in randomly shut down of computer 9 out of 10 case it’s problem with overheating. Overheating is generally caused by excessive use of laptop. It can also be caused by using your laptop in a place having high temperature, or by placing your laptop over the heating absorbing items. Another major cause of this problem is of cooling hardware or the dust problem. Most of the laptop after a long usage carry this major problem. In this, the laptops become extremely hot and the fan throws extremely hot air. How to fix: You can fix this problem by a cooling paste that is applied on the processor. Note, do not apply it by yourself, and fix this problem by laptop repairing shops. Or you can also check your fan if it is working well, or you can also buy a cooling pad. Battery problem is another major reason for random shutdown of laptop. This problem usually occurs after a long use age of laptops, or excessive charging. If your laptop shuts down randomly, test your battery if it’s working well or not. If it isn’t, you really need to buy a new battery. Make sure the battery has the same amperes the laptop requires, otherwise your laptop might have problems while working. This isn’t a common problem, but when it occurs, you cannot resolve this problem by yourself. If you are sure that all the parts of your laptop are working well, but the laptop just turned off, you should go and have your laptop checked by the service centers. Make sure the service center has enough expertise to check and repair your laptop. Because, most of the people do not have enough laptop hardware repairing expertise. This is the most common problem that persists in almost every computer. A Virus is like an Armageddon for computer. It almost destroys everything on your laptop. Do not panic, you can easily fix this problem by installing antivirus software. If you still have the virus problem in your computer, you need to go and have your laptop checked by the service center. Most of the laptops either stop working or just turn off randomly because of ram crashing problem. This problem generally occurs when your ram stops working or by the displacement of your ram. To resolve this problem, unplug your ram, cool and clean it out and plug it again. Check if the problem is solved or not. If it doesn’t go and have your laptop checked by the service center. There is another major cause for the laptops to turn off randomly that is the faulty power supply. It is the most dangerous problem as it can cause severe problems to your laptop like your laptop can go dead due to the faulty power supply. Because the value of current decrease and also increases, so it greatly damages the battery and laptop itself. If you are having the same problem, it is recommended for you to change your power supply as soon as possible. If you are not sure if it’s the problem of power supply, you can also test it, whether it’s working well or not! There is no doubt in the fact that the service of laptops is very important as it greatly affects the processing of laptops. With no service of laptop, there comes great problems. The most common problems are overheating, random shut down and slow processing. Therefore, it is mandatory to service your laptop regularly from dust for a smooth and fast processing. There is no other way to resolve this issue. What to do if everything fails? Another major question that often comes in every mind is what should be done if all the above reasons fails? Well, there is a simple solution to your problem. That is, you can simply reinstall your windows. How it will benefit? It will remove all the viruses from your computer and make the processing of your computer faster and smoother. In most of the cases, you might have seen some laptops don’t seem to work even after checking every part of your laptop! I myself had the same situation once. If you have the same problem with your laptop, it is recommended to take your laptop at the service center to get it repaired. There is no other solution to that problem. This is the only thing you can do if your laptop randomly turns off without any warning. These are some of the common reason why your laptop shuts down randomly and their solutions that can greatly help you out in resolving the issues of random shuts down of your laptops. The above mentioned solutions are the best and the easiest ways to resolve these problems. If you do not have such problems, you are the lucky one to use a perfect machine. “Why did the chicken cross the road?”. Most of us have already heard this phrase a million times. Isn’t it true? Since our childhood we have heard this silly yet funny joke. Basically this is a common riddle joke with hundreds of simple answers, the punchline or answer could be: “To get to the other side” this is the very basic answer. It is an example of anti humorous joke. People might get curious and they might think that the answer will be a punchline but its answer is a simple statement of fact. This can lead to very simple statements but definitely fun for you to play. 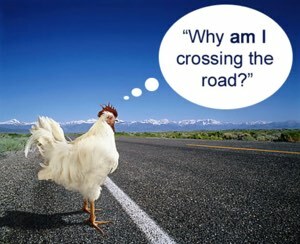 There are numerous funny jokes about why did the chicken cross the road. I decided to complete list of funny answers and jokes on this topic around the internet. I’m sure you’ll have some great fun reading it. 😉 Here’s a funny video to answer the question.